10 Facts About The Caribbean Region - Caribbean & Co.
During the media coverage of hurricanes Irma and Maria last September, it became apparent that many are not familiar with basic facts about the Caribbean region. 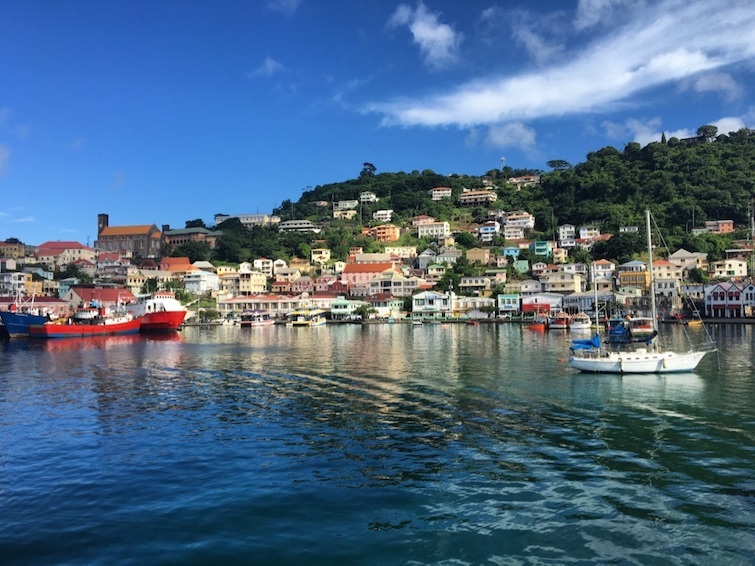 Some consumers and even journalists were mispronouncing the country names, and others couldn’t distinguish one island from another and were confusing the Dominican Republic with Dominica and Barbados with Bermuda. This lack of awareness and knowledge of basic facts about the Caribbean is shocking as the region is well traveled with over 30+ million stay-over tourists visiting each year; plus an additional 27+ million visiting via popular cruise ports in the Cayman Islands, Bahamas, and Turks & Caicos – all of which are open for business. Thus, at the Caribbean State of the Tourism Industry Conference held in Grenada shortly after the hurricanes, the Caribbean Tourism Organization indicated that they would be raising funds to launch a marketing campaign to assure consumers that most of the Caribbean destinations are now open for business and educating them on facts about the Caribbean. As while it is the sun, sand, and sea that draws people in, the Caribbean region has a rich history. 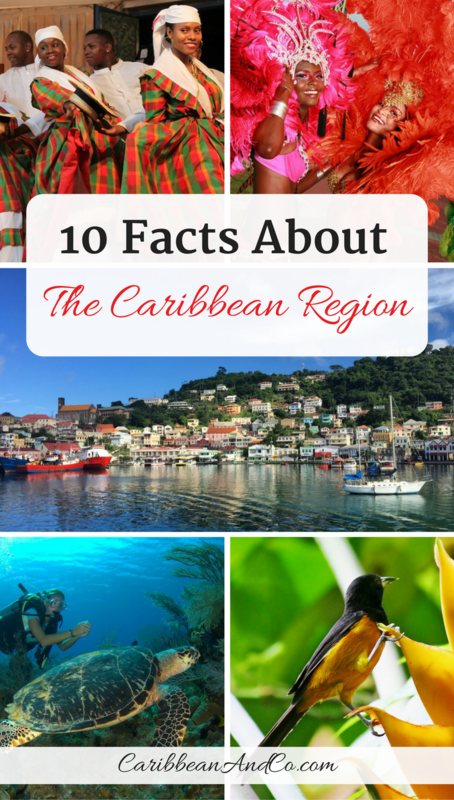 With that in mind, below are ten facts about the Caribbean region. Grenada: View of Carenage, a scenic inlet. One of the main facts about the Caribbean region is that it is called the Caribbean as when Christopher Columbus and his men were exploring the area during their second voyage, they stumbled upon a native tribe who resisted them, and so they deemed them aggressive and also falsely accused them of being cannibals. Columbus called this native tribe Carib, and over the years the name for the region evolved to be the Caribbean. Interesting, when Christopher Columbus first arrived in the Caribbean, he thought they had reached India, and so named the first inhabitants he met Indians. It wasn’t until his third voyage to the region that he realized he was nowhere near Asia. Note that the first land in the Caribbean region Columbus saw and visited on 12 October 1492, he named San Salvador Island now part of The Bahamas. This island San Salvador was originally named Guanahani by the native Lucayan inhabitants. To commemorate this first landing by Christopher Columbus, there is a simple white cross on Long Bay Beach in San Salvador, The Bahamas. 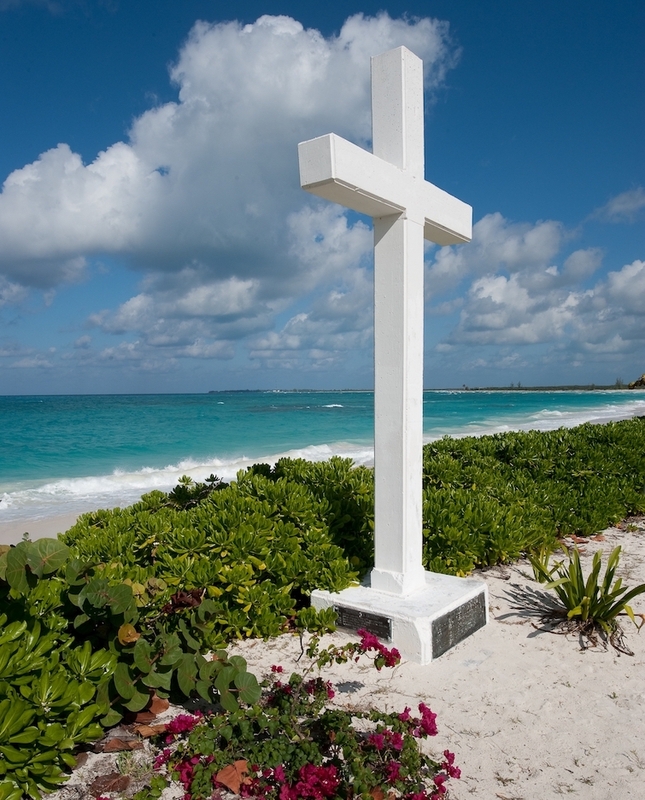 Bahamas: A simple white cross in Long Bay to commemorate the first Caribbean land sighted by Christopher Columbus on his first voyage in 1942. Photo Credit: © Bahamas Ministry of Tourism. The Caribbean region is located southeast of the Gulf of Mexico and the North American mainland and measures around 1,000 miles from north to south and over 2,500 miles from east to west. Much of it is ocean and the Caribbean region includes about 700 islands, islets, reefs, and cays in and surrounding the Caribbean Sea. Across the Caribbean region, there is diverse topography including coral reefs, mountains, tropical forests, low-lying plantations, valleys, waterfalls, and volcanoes. 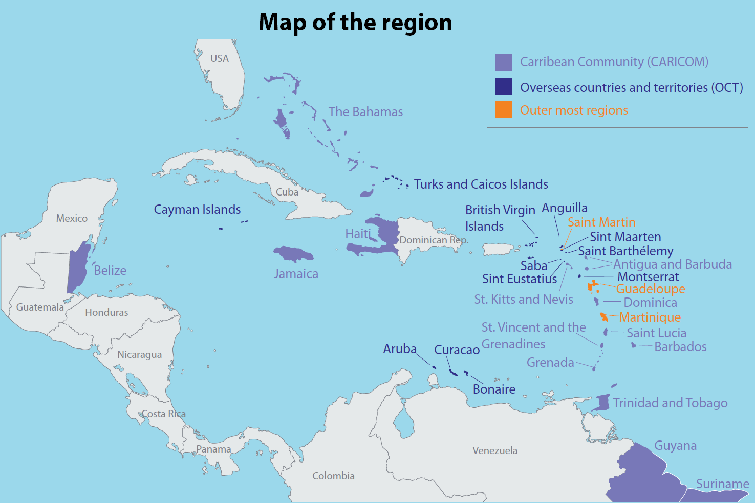 Only about 2% of the Caribbean region is inhabited, and so when most speak of the Caribbean region, they are referring to about 32 countries. Their size ranges from 40,852 square miles for Cuba all the way down to 5 square miles for the island of Saba. Interestingly, Saba has the shortest commercial airline runway in the world at only 1,312 feet long with one side flanked by high hills and with cliffs that drop into the sea at both ends. So not for the faint of heart! There are four main island groups in the Caribbean region including the Greater Antilles, Leeward Islands, Leeward Antilles and the Windward Islands. * The Greater Antilles includes Cayman Islands, Cuba, Haiti, Dominican Republic, Jamaica, and Puerto Rico. * The Leeward Islands includes Anguilla, Antigua & Barbuda, British Virgin Islands, Guadeloupe, Montserrat, Saint Martin, Saba, Saint Eustatius, Saint Barthelemy, Saint Kitts & Nevis, and U.S. Virgin Islands. * The Leeward Antilles includes Aruba, Curacao, and Bonaire. * The Windward Islands includes Barbados, Dominica, Grenada with sister island Carriacou and Petite Martinique, Martinique, Saint Lucia, Saint Vincent & The Grenadines, and Trinidad & Tobago. Note that the Leeward Islands, Leeward Antilles, and the Windward Islands combine to create the Lesser Antilles. Also, beyond the groupings, there is also the Lucayan Archipelago known as the Bahama Archipelago, comprising The Bahamas and Turks & Caicos Islands. Another of the main facts about the Caribbean is that beyond the islands in and surrounding the Caribbean Sea, there are other countries which are also associated with the Caribbean region mainly due to their cultural, economic and political history. This includes the island of Bermuda located in the North Atlantic Ocean, a mere 665 miles from the state of North Carolina in the United States and Belize also located on the North American continent. Finally, Guyana, Suriname, and Venezuela, three independent countries on South America’s North Atlantic coast. All five are members of the Caribbean Community (CARICOM) which was established in 1972 to promote economic integration and cooperation between member states. Belize, Guyana, and Venezuela are also current members of the Caribbean Tourism Organization, the official body promoting tourism in the Caribbean region. 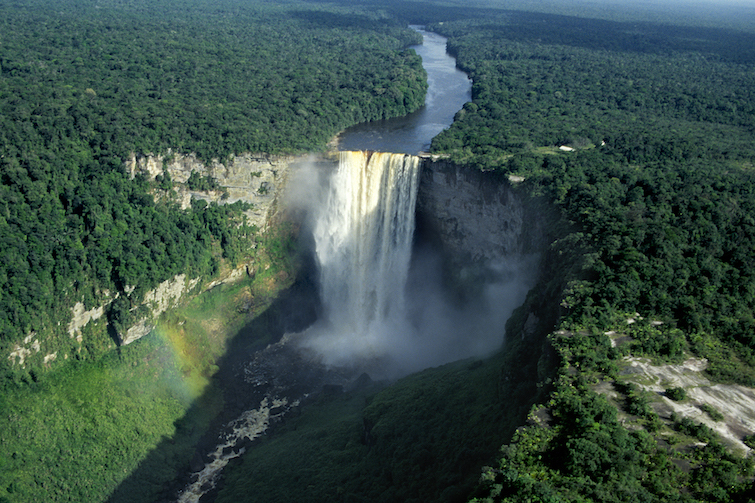 Guyana: Kaieteur Falls, the world’s largest single drop waterfall. Photo Credit: © Fotonatura via Guyana Tourism Authority. Except for Cuba which has a one-party political system, all other Caribbean countries now have two or more political parties, and their ways of governing can be traced back to their colonial roots. Some are independent democracies like Haiti which became the first black republic in the world and the first country in the Western hemisphere to abolish slavery after breaking free from France on January 1st, 1804. Others are still dependent territories of France, the Netherlands, the United States and the United Kingdom. * Independence from the United Kingdom: Antigua & Barbuda (1981), The Bahamas 1973), Barbados (1966), Belize (1981), Dominica (1978), Grenada (1974), Guyana (1966), Haiti (1804), Jamaica (1962), Saint Kitts & Nevis (1983), Saint Lucia (1979), Saint Vincent & the Grenadines (1979), Suriname (1975), and Trinidad & Tobago (1962). * Dependent on the Netherlands: Aruba, Bonaire, Curaçao, Saint Maarten, Saba, and Saint Eustatius. * Dependent on the United Kingdom: Anguilla, Bermuda, British Virgin Islands, Cayman Islands, Montserrat and Turks & Caicos Islands. 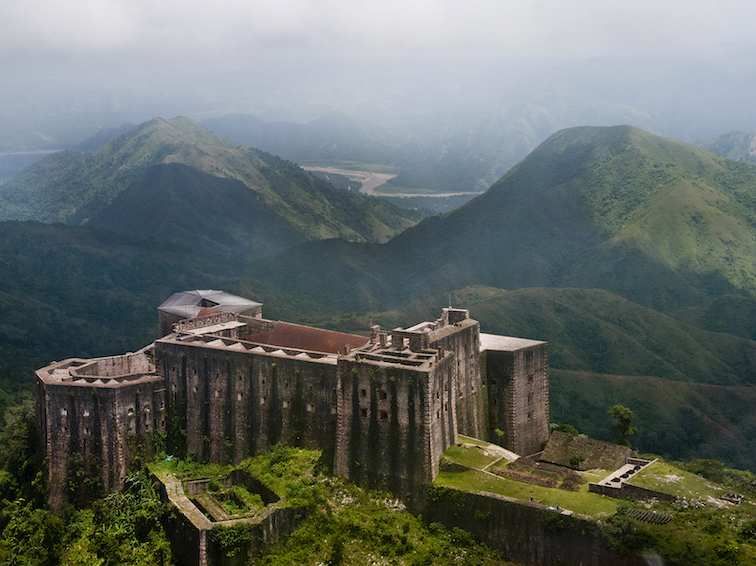 Haiti: The Citadelle Laferrière aka Citadelle Henry Christophe aka The Citadelle, a large mountain fortress at the top of Bonnet a L’Eveque. Photo Credit: © Haiti Tourism. Another of the major facts about the Caribbean region is that over 42.5 million people live in 30+ main islands. Many in larger islands like Cuba with 11.4million, Haiti with 10.8million, the Dominican Republic with 10.6million, Jamaica with 2.8million and Trinidad & Tobago with 1.3million people. And at the opposite end is Saint Martin with 31,500, the British Virgin Islands with 30,600, Anguilla with nearly 15,000, Saint Barthelemy with 7,200 and Montserrat with just 5,200 people post-eruption of Soufrière Hills Volcano. 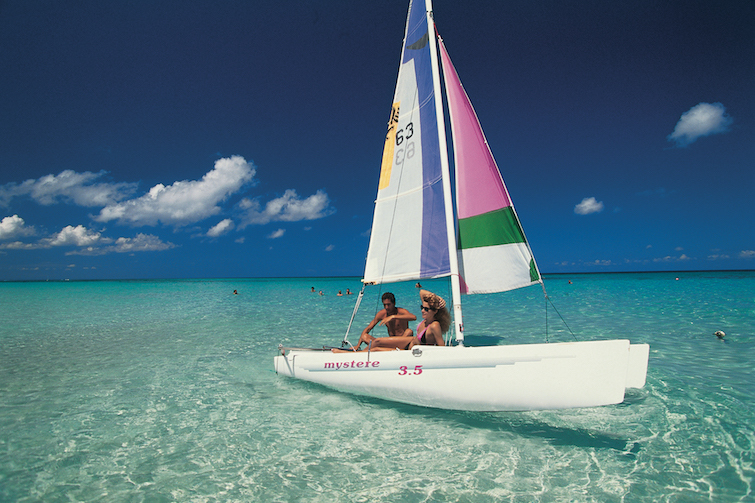 Cuba: A couple in a small sailboat in Cayo Coco, a tropical island in the Jardines del Rey chain, off central Cuba. Photo Credit: © Cuba Tourism Board. Early inhabitants of the Caribbean region were from the South American continent more than 7,000 years ago and were members of the Maya, Taino, and Kalinago tribes who settled on the various islands throughout the Caribbean region. When the European started colonizing the Caribbean region beginning in 1492 with Christopher Columbus for Spain, the indigenous population was decimated by disease and war. As the Europeans built up profitable cotton, tobacco and later sugar plantations, over 5 million West African slaves were brought to the Caribbean region as unpaid laborers. And today, the majority of the 42.5million people who live in the Caribbean region are descendants of these 5 million West African slaves. Now, you will also find other ethnicities in the Caribbean including Asian Indians, Chinese, Syrians, Lebanese, Jews, Portuguese, Europeans, Amerindians, and various mixes and combinations which makes the culture and traditions quite diverse. For example, in Trinidad & Tobago, based on the last census, descendants of West African slaves are 36.3% of the population and Indo-Trinidadians are 37.6% of the population – so pretty much neck and neck. Indo-Trinidadians are descendants of indentured workers from India who were brought over after slavery was abolished. That said, while the majority of the region’s inhabitants are descendants from West African slaves, its long history of colonization from European powers including the Spanish, English, French and Dutch, has resulted in a diverse culture across the region. Sure there are similarities, but each country has its own traditions and rich history worthy of exploration. 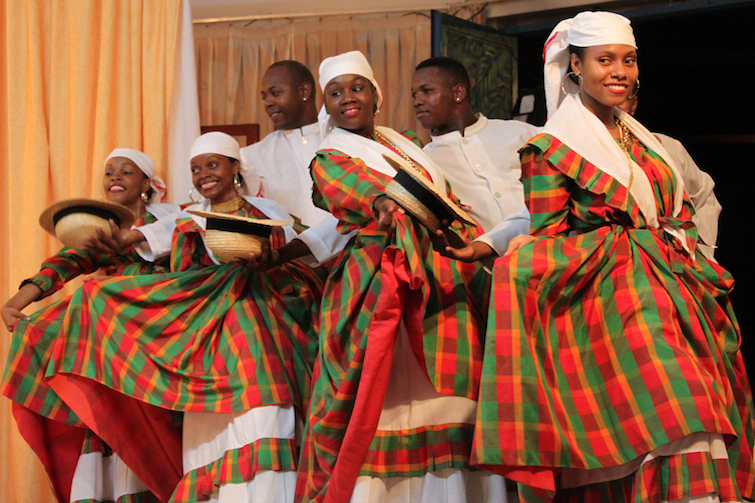 Martinique: The Grand Ballet dancers in traditional dress. Photo Credit: © Antoine Omere via Martinique Tourism Board. You will sometimes hear the Caribbean region being referred to as the West Indies. This term was used initially by Christopher Columbus and referred to the islands which he claimed for the Spanish crown. Remember, he thought he had arrived in India, and so he named the island grouping the West Indies to distinguish from the East Indies. The West Indies term was later adopted by other European colonizers, and so some Caribbean countries are referred to as being former members of the British, French, Dutch or Danish West Indies. The term is mostly now used in sports with the West Indies Cricket Team which is a multi-national cricket team representing the Caribbean region. Beyond cricket which is a legacy of British colonization and known as the Englishman’s game, the other major sport in the Caribbean is football. Sadly, no Caribbean football team has won the World Cup trophy. West Indies Cricket Team: 2012 T20 World Champions. Photo Credit: © Windies Cricket. The majority of 42.5million people who live in the Caribbean speak English as much of the region was colonized by the British. In total, there are six main languages used in the Caribbean region and some islands like Puerto Rico, and Haiti have more than one official language. * English is the official language of Anguilla, Antigua & Barbuda, Bahamas, Barbados, British Virgin Islands, Cayman Islands, Dominica, Grenada, Guyana, Jamaica, Montserrat, Puerto Rico, St. Kitts & Nevis, St. Lucia, Saint Maarten, St. Vincent & the Grenadines, Trinidad & Tobago, Turks & Caicos Islands, and the United States Virgin Islands. * Spanish is the official language of Cuba, Dominican Republic, and Puerto Rico. * French is the official language of Guadeloupe, Haiti, Martinique, Saint Barthelemy, French Guyana and Saint Martin. * Haitian Creole is also an official language of Haiti. * Dutch is the official language of Aruba, Bonaire, Curaçao, Saba, St. Eustatius, Saint Maarten, and Suriname. * Papiamento, a Portuguese and Spanish-based Creole language is also an official language of Aruba, Bonaire, and Curaçao. Beyond these six main languages, you’ll also find on many of the Caribbean islands a version of creoles and local patois – broken English being spoken. 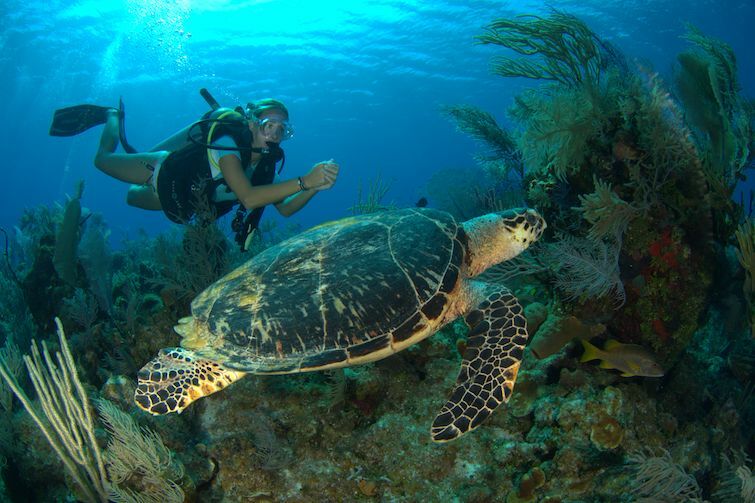 Cayman Island: Diver with a massive green sea turtle. Photo Credit: © Cayman Islands Department of Tourism. The plant and animal life in the Caribbean region is quite diverse. There are tons of beautiful flowers and wildlife including rare birds throughout the Caribbean region. In fact, there are over 500 species of bird, including 172 species that are found nowhere else in the world. Also, there are about 189 different species of amphibians, 497 species of reptiles and 164 mammals that live in the Caribbean region. Plus, there are lots of coral reefs, including the Mesoamerican Barrier Reef which is the largest marine habitat in the Caribbean. It has hundreds of fish species, marine turtles, and sharks, including more than 65 species of stony coral, 350 species of mollusk and more than 500 species of fish. 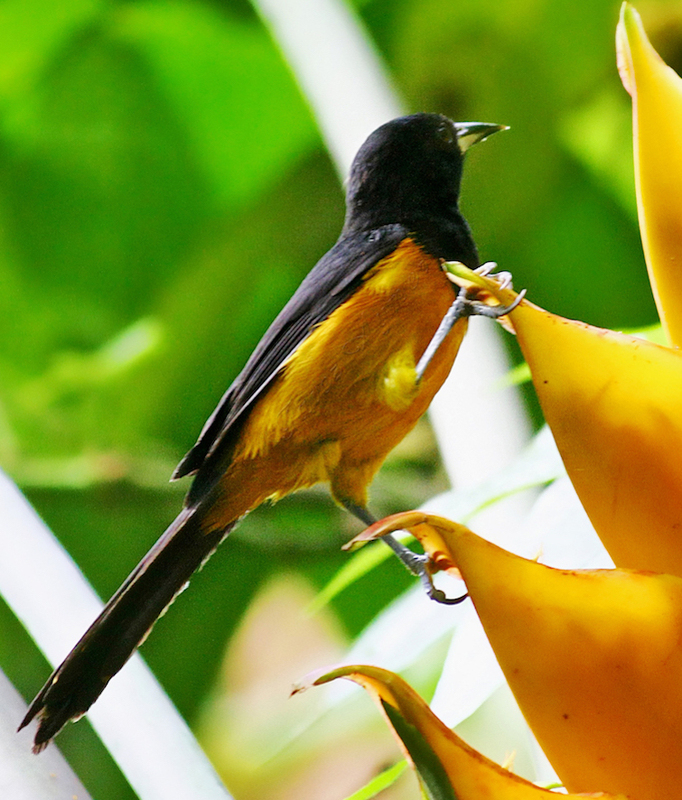 Montserrat: Oriole Bird once endangered. Photo Credit: © Montserrat Tourism Board. These are just a few of the reasons to visit the Caribbean region with 75% of the destinations currently open for business and welcoming visitors post hurricanes, Irma and Maria. So now that you are a little more information, here is hoping to see some of you in the region soon. These and other Caribbean related books contain a wealth of facts about the Caribbean and can be purchased via my Caribbean & Co. Amazon affiliate store.